Fish Management, or lack thereof..
FYI – The information below, while focused on the North Santiam, is not an isolated instance. This same scenario is happening in every tributary of the Willamette Basin right now. Winter Steelhead are now spawning in the North Santiam Basin. Normally, that would mean between 300-400 breeding pairs are doing their thing, which would translate to 300,000 – 600,000 fertilized eggs incubating in the redds over the next few months. I have no idea how many hatch, spend a year in the river, migrate to the ocean, and spend a coupe years in the salt. However, it generally means that between 600-1000 fish make it home to start it all over again. I know the start and the end. So let’s extrapolate that with what we’re likely to see four years from now. As of the end of March (nearly the end of the run cycle), we have 60 fish above Stayton. If evenly split between male/female, we have 30 breeding pairs that should equate to 30,000-40,000 eggs in redds (river nests). Some will hatch, live in the river and go to the salt. If we apply the math above, that means in 4 years we can expect 60 or so fish to return. That’s IF everything goes well over the next 4 years – good river, estuary and ocean conditions, gillnets stay off the mainstem Columbia and none of the highly populated cities along the river system have any major sewage or chemical spills. This is as good as it gets under current management practices. We might have a self sustaining run of 60 fish (that been nearly 1,000 for the past decade or more). We just lost over 90% of a run that’s been holding it’s own, at least for one cycle (in perpetuity). There’s one other intangible factor in all of this that’s hard to estimate. That would be the number of fish that are poached (intentionally or ignorantly) each year on the North Santiam. Maybe it’s not such a big deal in a normal year. And I don’t think it’s that large of a number – maybe 10-20 fish? But in a year like this – that’s 15-20% of the run. That suddenly become a pretty big deal. Those 60 become 40, then 20, then null in a very short time period. For the past several years, I have been advocating for fishing regulation changes that offer some protection for these fish. I’ve suggested we have some fishing closure windows on the North Santiam – not a popular idea. But an opportunity for this group of fish to not be hassled, hooked, and maybe even save a few from being poached. Afterall, it’s a lot tougher to lie your way out of a ticket by claiming that you’re fishing for some other species if the entire river is closed for a period of time. In all areas of the Willamette River and tributaries, including flowing waters, that are open to fishing for hatchery Chinook, hatchery steelhead, trout, or warmwater gamefish, anglers with a valid 2017 Two-Rod Angling Validation may use up to two fishing rods while fishing for any game fish or non-game fish species except sturgeon. Youth anglers under 12 years of age may use two rods in these areas without purchasing the Two-Rod Angling Validation. Angling for sturgeon remains restricted to the use of one rod per angler. All other rules and licensing requirements specified in the 2017 Oregon Sport Fishing Regulations remain in effect. How’s that for action? Reminding folks to buy their 2 rod validation so they can use 2 rods. Other than that, all regulations remain in effect. That’s like reminding the fox to bring along a buddy next time he visits the hen house! The prospects for the next 2 years (2 cycles) is not very bright either. Those are fish that were either fry or 1 year old (and still in the river) during the 2015 drought. We’ve know for 2 years that those cycles are likely to take a hit, and still, nothing from the ODFW to address that possibility. So what’s left? The wild fish that hatched in the North Santiam in the spring of 2016. The river was cool and in pretty good shape when they hatched and will likely be in good shape this year as they mature and head for the salt water. If the ocean time isn’t too rough on them, we may see our usual 600-1000 fish back. That would leave us with 1 out of 4 cycles that hasn’t crashed. Something to be thankful for. 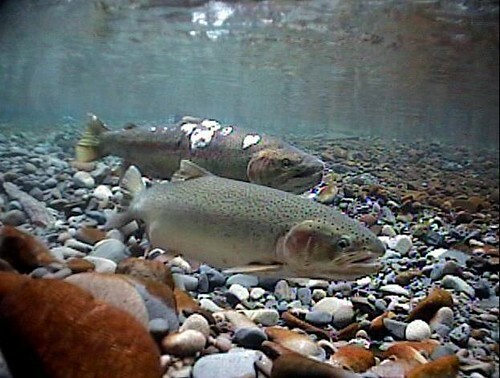 Steelhead are resilient and have proven over and over again that they can adapt and survive, but only if we take steps to help. In the big picture, we’ve taken some steps this year, but mostly backwards. I hope that changes very, very soon. Update 05/09/2017 – The Department of State Lands Board voted unanimously to keep the Elliot State Forest in public ownership and directed staff to explore other means of moving the property from the Common School Fund Trust. Update 04/03/2017 – It appears that State Treasurer, Tobias Read is having second thoughts on the matter and may be reversing his support of selling the Elliot State Forest to private interests. That would make it 2-1 against, with the only supporter now being Secretary of State Dennis Richardson. As a former resident of the Gem State, I’ve been curious about a 1990’s film named “My Own Private Idaho” when it shows up in the guide as I’m channel surfing. The title of the film gives one the impression that it might be a movie about the wild and scenic portions of the western USA. In actuality, the film is about a couple of homeless hustlers in Portland, Oregon that do whatever it takes to make a buck, including prostituting themselves. The old adage that “Life Imitates Art” recently occurred in the Beaver State as the Oregon Land Board voted 2 to 1 to sell off the Elliot State Forest for roughly $200 million dollars to a Timber conglomerate. This 93,000 acre chunk of publicly owned property contained, by some estimates, $500 Million dollars worth of lumber. The purchasers got a pretty good deal – spend $200 Million for something worth twice that amount. But the deal is even sweeter when you get down to the details. Once the timber company has raped and pillaged, extracted every last bit of income they can get, they have an option to sell the property back to the State for another handful of millions! Then the taxpayers in Oregon can pay to clean up the mess, plant new trees and rebuild the forest (most likely to sell it off again in a few decades). Couple all that with the fact that Oregon has the most lenient Forest Practices regulations in the West, and the newly minted Commander in Chief is attempting to do away with that pesky EPA, and you’ve got a recipe for taking the entire Forest down to bare dirt. Fish and Wildlife will be decimated. Water, air and soil conditions will be horrendous. And let me point this out one more time – they will sell this great wasteland BACK TO THE STATE OF OREGON! You and I will again be owners of what we once owned, only now, it’s going to cost us millions of dollars and years of work and waiting before it will ever be considered a forest again. In the meantime, species of fish, plants and animals will suffer or completely disappear. Once you’ve taken everything of value (timber, mineral resources, etc.) just walk away, it’s not your problem! That’s it! You’ve now more than doubled your money. You’ve sent the raw materials overseas so that foreign interests can profit by selling products made from those raw materials back to American citizens. There are a few more ways you can maximize your profits, but I’ll save those bits of information for another post. Come back soon and learn how to avoid property taxes, get income tax breaks on the profits. And if you have the moral fortitude of our new president, you can even file for Chapter 11 and not have to pay back any loans you may have incurred to work the deal in the first place! Yup, America is going be great again, starting right here in Your Own Private Oregon.